Introducing this gentle giant cuttlefish (Sepia Apama) . It's so pretty with the bright colour. I love that fin it has that looks like skirt, flowing elegantly as it moves. Usually found around seaweed area at Fairy Bower, Cabbage Tree Bay in Shelly Beach. Some are huge. This one was about 30cm, not the biggest I have seen. 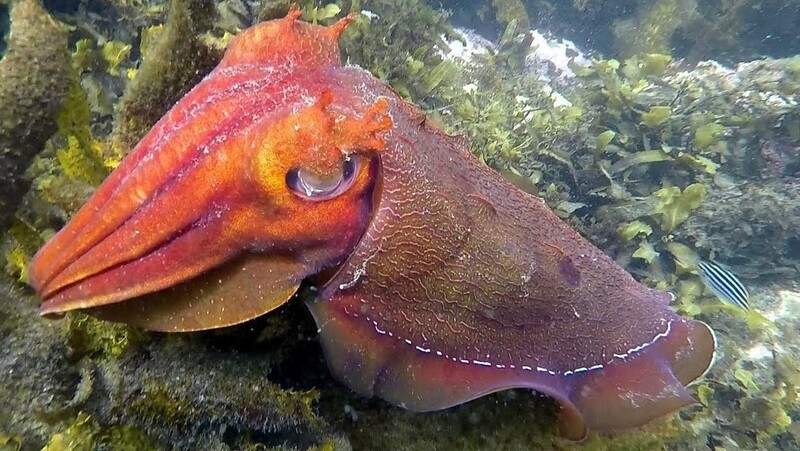 Using cells known as chromatophores, the cuttlefish can put on spectacular displays, changing color and body texture in an instant, blending with the surrounding. Master of camouflage. It's fastinating to watch. They can often be seen with their body pulsating different colours, very pretty. During winter they come together to mate. Death follows shortly after mating and laying of eggs that will spawn the next generation. Cuttlefish bones are often found washed up on beaches indicating that the breeding season is over. The mantle length of the Giant Cuttlefish can reach up to half a metre and the species can grow to a total length of 1 metre. This species has a life span of about 2-3 years and can weigh up to 10kgs. I once had big giant cuttlefish swam with me for good half hour! Best experience ever. It was so curious and let me swim really close and didn't even swim away. I noticed the eye movement when I slowly approaching, big sparkly marble looking eye. Just beautiful! We're you underwater with this one?? @30pics4jackiesdiamond yes, about 4m deep, I was so excited to see the giant cuttlefish, so hold my breath and dive down to see it closer. So beautiful.